I’m a sucker for frosting. Always have been, always will be. I blame my dad’s genetics for this. I can remember way, way back in the day, my mom eating her cake and forking the frosting over to my dad—lifting fat purple rosettes and scraping up smears of inky blue piping, handing over whole panels from the top and end of her slice. I’m pretty sure there were similar exchanges between my brother and me as well. My dad and I share a lot, but if we sit down to cake together, you can bet our greedy, frosting-loving forks will remain on their respective plates—unless they’re fighting over what’s left on someone else’s. Yessir, the frosting is where it’s at. Except when it comes to a certain carrot cake. But it’s carrot cake, you’re saying. Delivery vehicle for the almightiest of the mighty: cream cheese frosting! 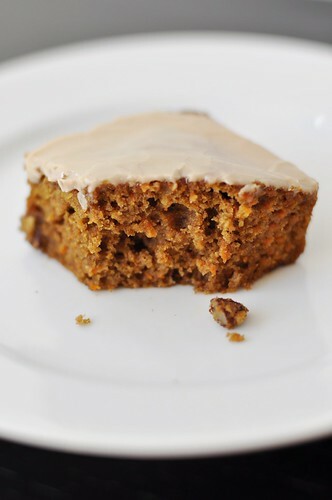 Sure, most carrot cake is good enough with its cinnamony sweetness and vegetal title that, on some subconscious level, assuages the guilt you might otherwise feel when reaching for that second slice. But let’s be honest. It might as well be pumpkin cake, or apple cake, or my forearm—if you slather it in cream cheese frosting, it’s going down the hatch. 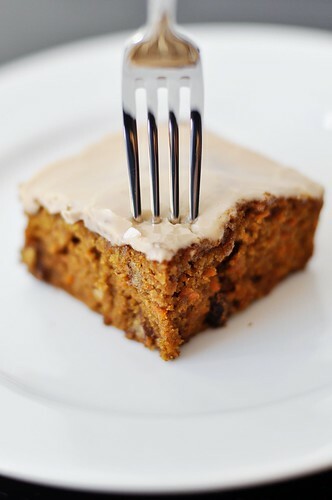 This carrot cake, however, has the ability to stand all on its own. Cinnamon and nutmeg keep it feeling familiar, but the addition of cardamom makes it something special. It’s a moist and tender cake, constructed on a foundation of teff flour and sweetened with the dark, molasses taste of sucanat. It’s the sensible older sister to the classic, holding down a job and reading Tolstoy in her spare time while lil’ sis shops Forever 21 and slurps a frappuccino. Please note at this point that I said that this cake has the ability to stand on its own. I never said that it must or should (my genetic predisposition to frosting means I have a hard time leaving well enough alone). So, while the traditional cream cheese coating would probably suffice, I felt that this cake called for something unfamiliar, something to work with the spices and make the caramel notes in the pecans really sing. A maple icing was just the thing. Whether you choose to ice it or frost it or leave it bare, this cake is sure to become a fast favorite. It’s straightforward enough to set out at a backyard gathering, but that little something extra makes it impressive enough to serve alongside post-dinner coffee. Or with first-thing-in-the-morning coffee. I can blame cake for breakfast on my genes as well, right? In a medium bowl whisk the sucanat with the oil. Add in the eggs and vanilla and whisk until smooth. Whisk in the water. Add the wet ingredients to the flour mixture and whisk until combined. 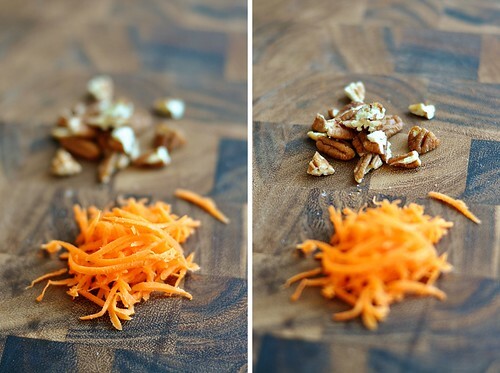 Stir in the grated carrots and then fold in the chopped nuts. 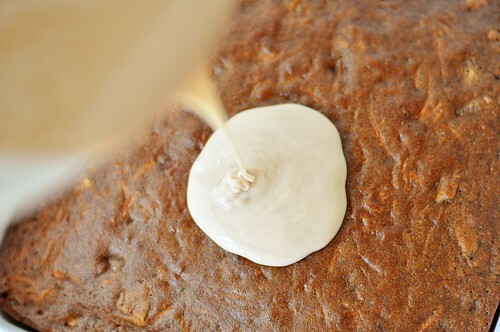 Pour the batter into the prepared baking dish and bake for 30-35 minutes, until the cake is puffed and firm and a knife inserted into the center comes out clean. 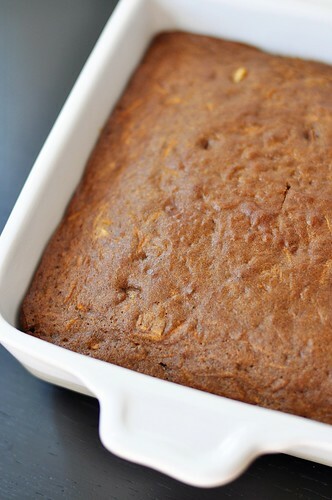 Allow to cool completely before serving and/or icing. Store iced cake in the refrigerator for up to several days**. **Totally kidding–it’ll keep, but you’re going to eat it all way before then.